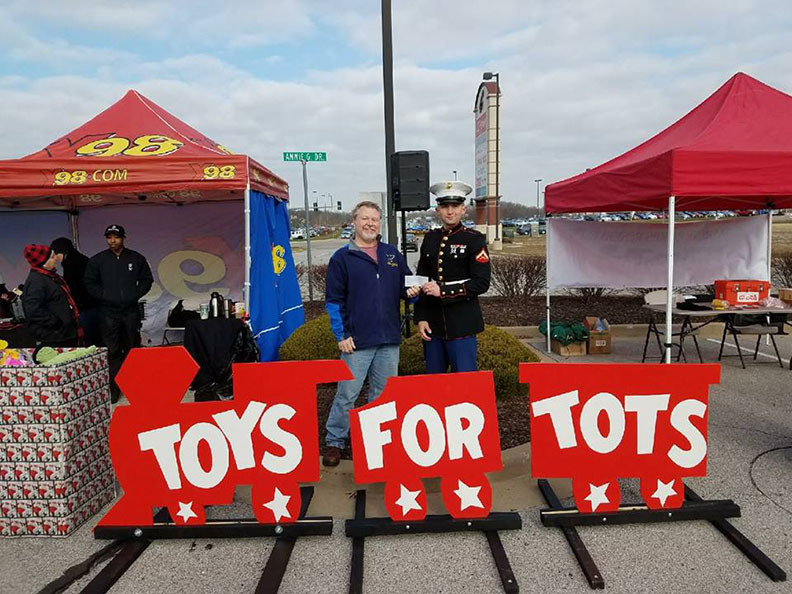 The Gateway Chapter of the International Plastic Modelers' Society (IPMS) donated $661 to the United States Marine Corps Reserve (USMCR) Toys for Tots campaign in Metropolitan St. Louis today (December 15). The club presented its contribution at a Toys for Tots toy drive held at The Summit at Gravois Bluffs, 788 Gravois Bluffs Blvd. in Fenton, Missouri. Radio station Y98 (KYKY, 98.1 FM) broadcast live from Gravois Bluffs during this event. IPMS/Gateway raised the money primarily through a kit raffle held during the IPMS/Gateway Invitational contest, which was held on September 9, 2017 at the Holiday Inn St. Louis SW--Route 66 in Sunset Hills, Missouri. Funds were also raised through 50/50 raffles held at a few IPMS/Gateway meetings. Half the money raised by these drawings went to the Toys for Tots contribution, while the other half went to the persons holding the winning tickets. IPMS/Gateway is a club devoted to the hobby of scale modeling and is open to all persons interested in this hobby. The club meets on the third Tuesday night of each month, with the next meeting on Tuesday, December 19 at 7:30 pm. Meetings are held in Lewis Fellowship Hall of Calvary Presbyterian Church, located at 3400 Lemay Ferry Road in Mehlville, Missouri (south St. Louis County). For additional information, please visit www.ipms-gateway.com or www.facebook.com/IPMSGateway/.